Welcome to Nurture's 2019 Spring Intern! - nurture. Welcome to Nurture’s 2019 Spring Intern! 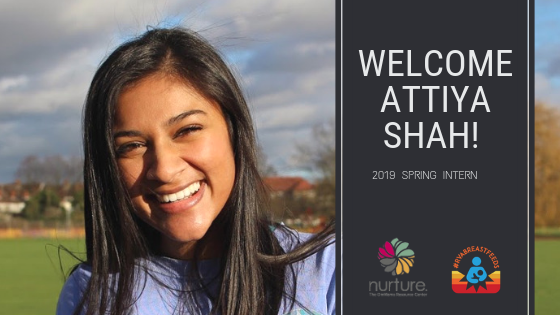 This month Nurture welcomes VCU student Attiya Shah as our spring semester intern. In just one week, she’s already been of immense assistance as we plot out our #RVAbreastfeeds campaigns for the year, plan for our upcoming 2019 Birth & Baby Fair, and begin reviewing our Community Needs for Pregnancy and Early Parenting Survey. Welcome Attiya! My interest in health, and the study of the human body started very early. As I got older and was exposed to a variety of career options in the health care field, I found myself deciding between nursing and physical therapy as my future profession. After hundreds of shadowing hours, I found that what interested me most was the study of human movement, therefore I decided to pursue my undergraduate degree in health sciences as a pre-physical therapy student. My career goal is to become a pediatric physical therapist! One of the physical therapists I shadowed was a pelvic floor specialist, so I was able to observe her treat several pregnant patients. I found myself fascinated by the changes that had to occur within the human body to accommodate for the growth of a baby. While my experience with pregnant women is not extensive, I am eager to learn more about pregnancy, birth, and the struggles families face after the birth of a child. At VCU, I participated in a two-year living-learning community called ASPiRE. As an ASPiRE student I was required to participate in 100 hours of service in and around the Richmond area. Through this experience, I was able to see members of the community directly benefit services much like the ones provided by Nurture, and I therefore understand the importance of providing additional resources to underserved populations.